In it's third year, the Fashion Tech Forum (FTF) 2016 was held at Duggal Greenhouse in Brooklyn, New York. 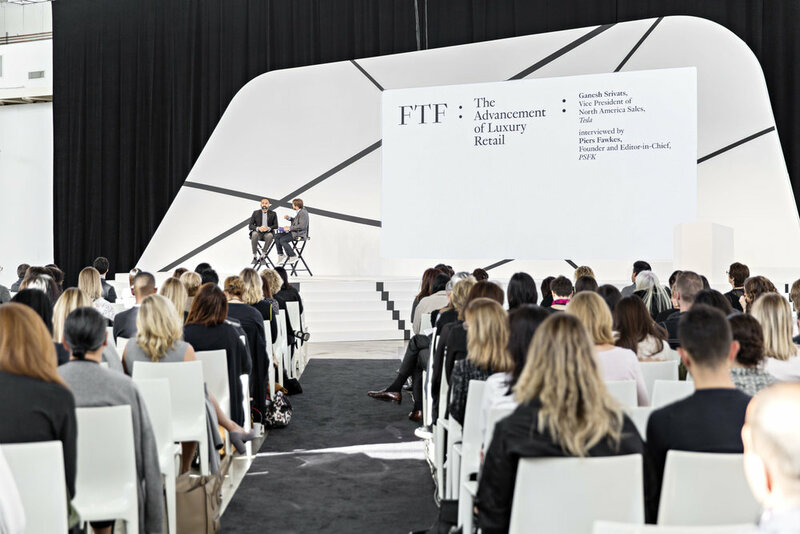 Numerous speakers from successful brands (such as Snapchat, Verizon, DVF, Google, Theory and Everlane) came together to discuss topics such as: human curation in the digital age, transforming retail experiences, and redefining a legacy brand. Here, we are sharing our key takeaway points from this year's FTF. FTF founder, Karen Harvey, started the morning off by giving the attendees some words of inspiration: "Leaders are those who try to know what they don't know." As a Zen practitioner, she talked about the importance of taking a little time to "go away" and clear the mind, which is why her introduction was followed by a meditation session led by Zen priest and teacher, Roshi Enkyo O'Hara. Roshi talked about how both things and we are changing—comparing it to being on a river boat where it seems as if "the shore is moving, but it is we that are moving." It was a delightful start to the day, and we learned how important it is so spend at least ten minutes a day to appreciate our lives regardless of the challenges or pressures we are currently facing. Later on, lululemon's CEO, Laurent Potdevin, touched upon the idea of balancing mindfulness and innovation by saying the "only way to have a high-performing culture is to have mindfulness and being in the present. Sometimes you have to go slow to go fast." Someone with a different perspective was Robbie Meyers, Editor-in-Chief of ELLE, a magazine that has proved to be very innovative and technology-savvy by incorporating aspects of online platforms, television, and virtual reality into their storytelling. Robbie shared her definition of the "modern woman," where there is no work-life balance, and how we should be lucky to feel worn out at the end of each day, since we have all these choices that women did not have in the past. Throughout the rest of the forum, common themes discussed included innovation, wearable technology and redefining the luxury experience. Talking about their Innovation Center, stationed nearby their SF headquarters, President and Ceo of Levi's, Chip Bergh, explained their partnership with Google to create wearable, washable, and hidden technology—their new denim jacket for the "urban commuter" that transfers phone capabilities to the jacket cuff (basically, you can get directions and get calls from people without having to take out your phone while biking). It's the perfect example of how technology should be incorporated into fashion as a "mini superpower," where "if you're not using it, you don't see it." Tesla's VP of North America Sales, Ganesh Srivats, brought up the point that the fashion and tech worlds actually face the same problems—striving to establish physical and real customer experience and to reach millennial customers in new ways. This is why Tesla opened their Red Hook, Brooklyn location (so New Yorkers have the opportunity to test drive the cars), why the majority of employees in the store are product specialists (to educate people) rather than salespeople, and why everyone who attended the forum got a free overnight loan of a Tesla for the true luxury car experience. Similarly, speakers from Rent the Runway, Spring and Maple, gave helpful advice on human curation and customer service in the digital age: 1) Customer service online should be like navigating through a retail store in that people can choose to explore the site on their own or ask for assistance, and 2) Staff should always be honest with recommendations, instead of lying to increase sales, in order to build loyalty. Following lunch, Sarah Robb O'Hagan gave an energizing, inspirational keynote, telling us to be "extreme," and to challenge ourselves in order to "change the game." A big takeaway from her talk was to "get our of your comfort zone to become curious, [and to] listen, learn and grow" and that "it takes extreme focus to achieve extraordinary results." According to Sarah, "needs are evolving faster than we are...[which is why] you need to make investments without knowing what's going to happen. You can't make judgements or decisions based on what's worked in the past." 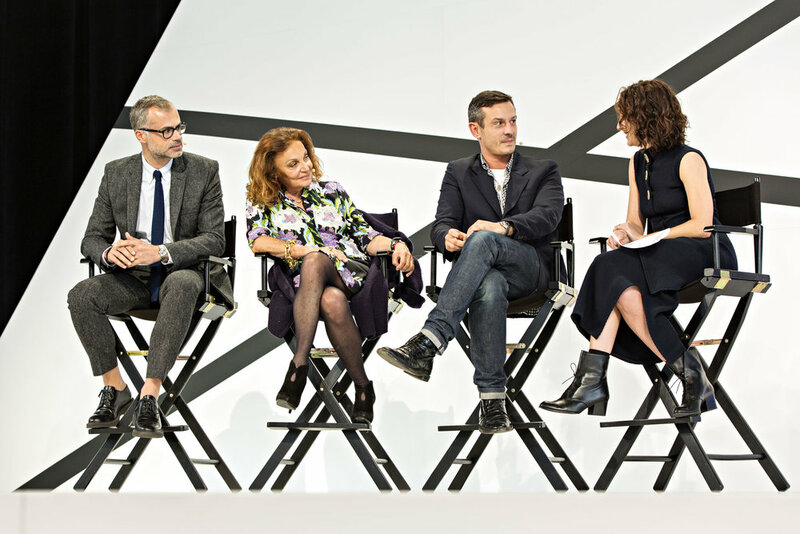 Our last takeaway comes from the ever-fabulous Diane von Furstenberg, her CEO Paolo Riva, and DVF's newly appointed Chief Creative Officer, Jonathan Saunders. DVF's panel was one of the highlights in our opinion, because of how much wisdom, advice and humor she was able to pack in 30 minutes. Diane explained how they needed to reinvent the business model and to have new branding without taking away from the heritage—which is why she had to take a step back to let Jonathan succeed and "push the refresh button." She also spoke about her role as the President of the CFDA, saying that the digital revolution has hit every industry, and that "we are all surfing a tsunami" with an unknown destination. Because of that, you have to focus on what makes you different and what you can offer. And some last words of advice: "It's an advantage to be small. Everybody can have a website and social media... A tree may not look good with few, small branches, but in the spring, it will be bigger."